Yeah, sorry if it's sort of a repost. The submission wasn't rejected as far as I know (yet) but after seeing several other submissions I realized I hadn't formatted the original correctly. Can we put up a rule or recommendation that screenshots have to be kept in spoilers? Some of these posts almost spam the thread pages with images. Description: Nobody will want to pass by this system and miss out on the opportunity to profit from no less than seven terraformable bodies to be found within easy distance from the main star. A terraformable high metal content world (orbited by a terraformable rocky body) coast around the system as a whole, whilst 5 more terraformable high metal content worlds fit neatly into the goldilocks zone of the fourth star in the system. Taking the time to visit (and map) Lucky Seven will drop several million credits onto your exploration log making the trip here wholly worthwhile. The two landable bodies D3 and D5 sport distinct polar ice sheets for the intrepid explorer along with views of their binary pairs. Great find. THis is exactly the type of stuff we like to add. Description A rocky ice world orbiting a gas giant with water based life right on the cusp of its icy rings, giving it a look similar to the silver highway before lighting changes broke the highway's majesty. The planet provides a breathtaking view of the gas giant's rings as they orbit around the gas giant, though the planet itself is fairly standard with water geysers and several mountain ranges. Need to confirm here: Does the WW orbit between the rings of the class III gas giant? Also, EDSM shows a single AW, not a binary pair. Description: A system with a class III gas giant orbited by a WW between two ring systems and a class I gas giant. It has a binary AW as well. Anyone have a picture of the Sagan Research Center outpost? Our current photo link is broken for it. I found this system, and it's an adorable little miniature system. The T-Class Dwarf has expansive rings, and is 0.04 Solar Masses. It's the smallest of each of these types of stellar objects that I've personally seen. And all happen to be in the same system. I must apologize, as I had accidentally submitted a location and images not concurrent with the planetary photos of the phenomena I have submitted, the new location and orbital info should now be corrected. To add context, I have quoted my revised submission in this post. What!!! How is this possible?? Is this some kind of mystery we have stumbled on, or some kind of weird artifact on generation because of cosmic rays hitting the computers exactly when this system was made?? Description While geologically uninteresting with silicate magma, B 1's distinctly malformed shape perfectly demonstrates Newton's law of Universal Gravitation from is numerous "flat" surfaces, making objects on those surface's fall towards the planet's center of gravity instead of perpendicular to the ground. If one were to drive from one end of the "flat" surface to another in an SRV, they would find their angle relative to the body's center of gravity to slowly move over time as they drove. Additionally, the planet does feature a prominent dent in its side, making it appear as if it were hit by a massive asteroid. What I wanted to say with binary was that the AW and the class III gas giant are orbiting each other, sorry for the confusion. And, yes the WW orbits between two different rings of the gas giant. Descripiton: beautiful looking crater, one side covered with ice (?) and the craterrim shines in a blue light. Description: Between the DW2 POIs of Bleia Flyuae ZU-N d7-54 and Byua Aub WO-K b36-0, this moon moon orbits it's parent at around 4Mm. It has a number geyser geosites from which you can see it's looming parent. The parent moon is landable too. Between them they supply most of the ingredients for Jumpomium. The grand-parent planet is an attractive blue, ringed-gas giant with mine-able hotspots. Description: Planets 6 and 7 are a binary pair consisting of an Earth-like World and a Terraformable Water World orbiting a Class A star. The name "Once in a Blue Moon" denotes the view of a blue moon from either of these planets, and also hints at its rarity. System also contains two Terraformable HMCs and a non-terraformable Water World. Conveniently located halfway in between "Rendezvous Point" and "Luna's Shadow". Description: A small ( 0.1194 Earth masses, 3,358km radius, 0.43G) Water World with an active water based chemistry and carbon-water-based life who is a terraforming candidate, this planet is orbiting about 2 Ls away from a Class III gas giant (with a radius of 71,338km, and is 4,110ls away from the main star), this gas giant also has a high amount of high value mineable resources. Description: Planet 9 is a land-able Terraformable HMC paired with a ringed Brown Dwarf, and it has Geological Sites containing iron magma lava spouts. Geo Site 5 in particular is located on the rim of a large double crater, which makes for great views. This system also has 3 ringed Metal Rich Bodies and a ringed HMC, most of which are land-able. The pair of ringed Metal Rich Bodies orbit very closely. This system contains all the materials necessary for FSD Injections of all grades. 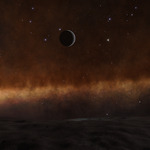 Description: This High metal content world is only 9 ls from its main m class star. It stands out not only how close it it is to its main star but because of its amazing red colour and the view of the galactic dust around the primary star. Description: This amazing ice world is in a system that includes a ringed water world and a number of gas giants, one of which has opals and diamonds. However, the most amazing thing is the views from the planet surface which has long blue valleys on its brown surface. Landing at the right place in one of those valleys at the right time can give you an amazing view of the galaxy background, a ringed gas giant, nebula, and two suns. Description A very large mountain range, estimated to be between 5km and 6km high compared to the surrounding surface on a very small moon of a moon of a gas giant. The body itself is tiny and irregular in shape, with a (mean) radius of just 414km, but yet has 19 geological sites (silicate vapour geysers). The planet is just under 30kls from the entrance point. The mountain range is about 56km North East of Geological site 11. The system itself is classified as a "green system" by EDSM due to the presence of all the Jumponium materials.